With this project you can program an AVR microcontroler ATMEL (ATmega8, ATMega32, ...) from a parallel printer LPT1 using ISP functionality In System Programming. 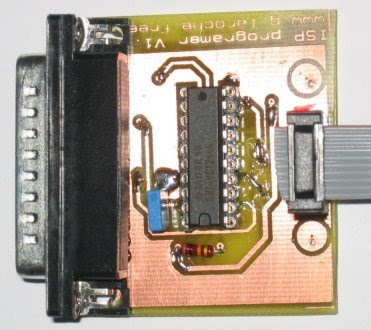 This programming type can program and/or configure microcontroler directly on the target board without removing device and put it on a separate programmer. This board is compatible with programming software "PonyProg". You can check USB AVR Microcontroller Programmer and Simple ISP AVR Programmer for another AVR Programmer project.